TAURANGA, 12th April 2014: New Zealand marine company BalexTM Marine are due to launch the world’s first automatic boat loader on May 15th at Hutchwilco Boat Show in Auckland New Zealand (Hall 5 – Stand 511). Lex Bacon, the New Zealand inventor behind Balex Automatic Boat Loader (ABL), started developing the innovative new solution after years of observing frustration and danger at the boat ramp. In NZ, with over 350,000 existing trailer boats and 5,000 new registrations per annum, the problem affects a significant portion of the recreational boating population. The problem grows exponentially in overseas markets with 12.5 million registered trailer boats in North America and 900,000 in Australia alone. Recognising an untapped opportunity, Bacon began to develop a solution to provide boat owners with hassle free launch and retrieval of trailer boats; the Balex Automatic Boat Loader was born. Paul Symes (left) and Lex Bacon. Paul Symes, Managing Director, joined the business in 2013 after spotting Bacon’s novel product. Symes founded 4D Global Group Inc (4DGG) in New Zealand in 1995 and grew the company to become one of Australasia’s largest Steel Detailing and BIM Service businesses, with offices in NZ, Australia, Philippines, Canada, and the USA with over 200 staff. He relocated to Manila, Philippines, in 2006 to establish an operations centre. In 2011, 4DGG was merged with PDC Group in Australia, where Symes maintained a position on the Board of Directors, Regional Director for Asia/Pacific, and General Manger of Commercial Projects in North America. Also a keen boatie, Symes has been focused on delivering the ABL to market. Grant Dixon, editor of New Zealand Fishing News, also sees a lot of potential for the ABL. Two versions of the boat loader will be available for the initial launch to handle boats up to five tonnes. The system can be fitted to any existing or new wobble-roller trailer and works across aluminium and GRP hulled boats. The first Balex Automatic Boat Loader product line will be launched at the Hutchwilco Boat Show in Auckland from 15th to 18th May. Balex will also be exhibiting at the Auckland on Water Boat Show in September and the Fort Lauderdale International Boat Show in the US in November this year. Find out more at balexmarine.com. Balex Marine Ltd is based in Tauranga, New Zealand. Balex Marine Ltd specializes in the development, sales and marketing of a revolutionary new automatic boat loader for the launch and retrieval of trailer boats. A world first, the ABL has an international PCT patent pending and incorporates proprietary technology. It is the first in a range of products in the Balex Marine portfolio targeted at improving the boating experience. 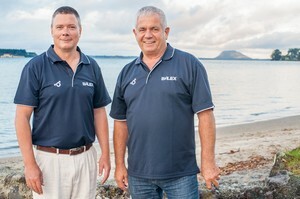 The team behind Balex Marine, Paul Symes and Lex Bacon, possess a unique combination of product engineering, and sales and marketing experience in international markets. They are also seeking interest from potential distributors or retailers in both domestic and international markets.